To get started, we need to download the Zotero 5.0 Standalone Software. This will be downloaded to your computer's hard drive, where it can be accessed offline. The installation examples in this guide are for Windows operating system, Mac Operating system, Firefox browser and Chrome browser, but the process is similar across all platforms. 1. Go to http://www.zotero.org/ and click the big red button that says "Download Now". 2. Click "Download". Make sure you choose the Zotero that is specific to your operating system (Windows, macOS, or Linux). 3. In Firefox, when you click "Download", the following setup window will appear. Click "Save File". 4. A window will pop-up asking you to name the file. Do not change the file name. 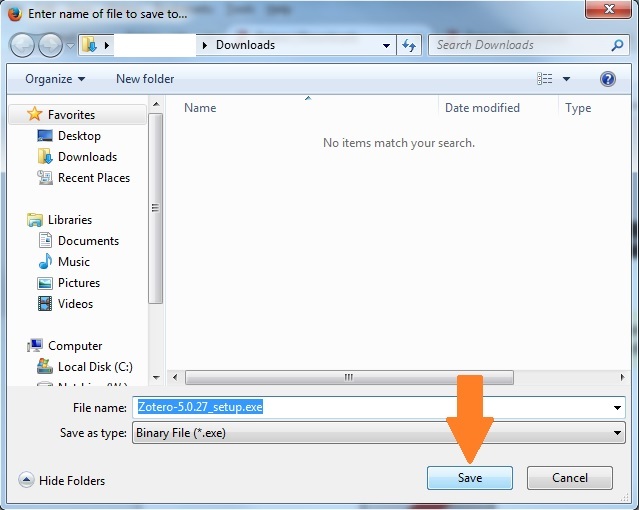 Just click "Save" and the file will download to your default downloads folder. 5. Go to the downloads folder in Firefox (the arrow pointing down beside the home icon in the top taskbar). Click the .exe file to open it and select "Run". 7. Next, the wizard will appear! Complete the four steps in the Setup Wizard. Choose "standard" installation, then click "install". On the last screen of the Wizard, click "Finish". 8. Zotero will open, and you can proceed to Step 2 - Installing Zotero Connector. 2. Ensure you have selected "macOS", then download the .dmg file. 3. 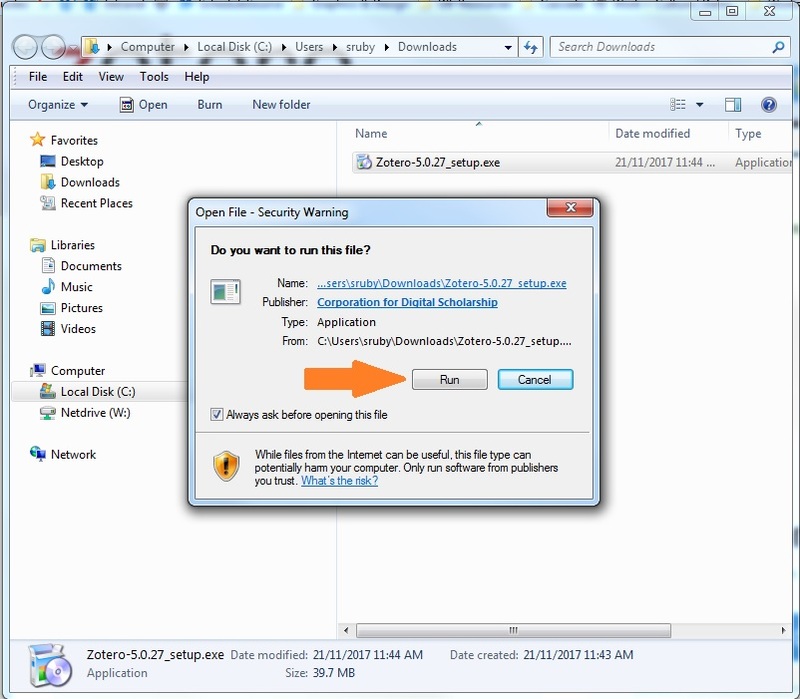 "Open the .dmg you downloaded and drag Zotero to the Applications folder. You can then run Zotero from Spotlight, Launchpad, or the Applications folder and add it to your Dock like any other program" (from Zotero.org - Documentation - Installation). 4. Zotero should now be installed on your device! You can now proceed to Step 2 - Installing Zotero Connector. Now that we've downloaded the software, we can install the Zotero Connector. The Connector is a tool within your web browser that automatically senses content and lets you save that content (be it a journal, a web page or a book) to Zotero with a single click. The connector you download will be automatically matched to whatever browser you are using at the moment. 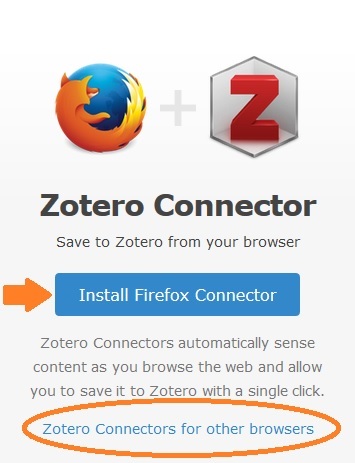 In this guide you'll see a Firefox example, but Zotero's connector also works for Chrome and Safari. 2. Click the large blue button that says "Install Firefox Connector". If you're using Chrome or Safari instead of Firefox this will say "Install Chrome/Safari Connector". Make sure you're using the web browser you commonly do your research and homework through. 3. You may be prompted by Firefox before the download can happen. Just click "Allow". 4. A final pop-up will ask you to install the extension. Click "Install". You may have to click the puzzle-piece in the search bar to find this prompt. In some cases, a tiny Z icon will appear in the top right corner of your browser, after you have installed the connector. Click the Z once, and you should get a message saying you have successfully installed Zotero Connector. 5. That's it! You have successfully downloaded Zotero 5.0 and the Connector. Now you're ready to add sources to your library. 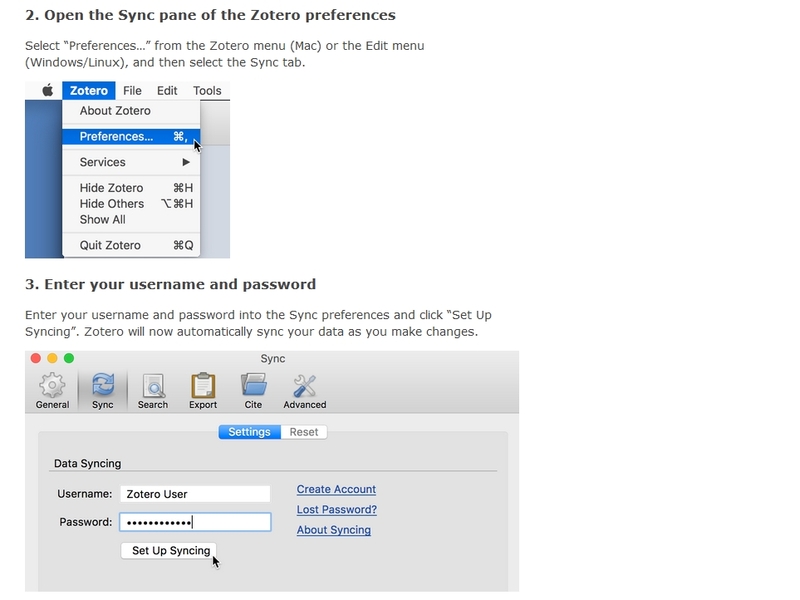 If you create a Zotero.org account, you can use the cloud to synchronize your desktop Zotero library across a variety of devices. This is a great feature if you split your time between home and work or school, and don't feel like bringing in a laptop every day. Setting up an online account is very simple, and only requires you to share an email address. Please note, this means your data will be hosted on U.S. servers. 1. 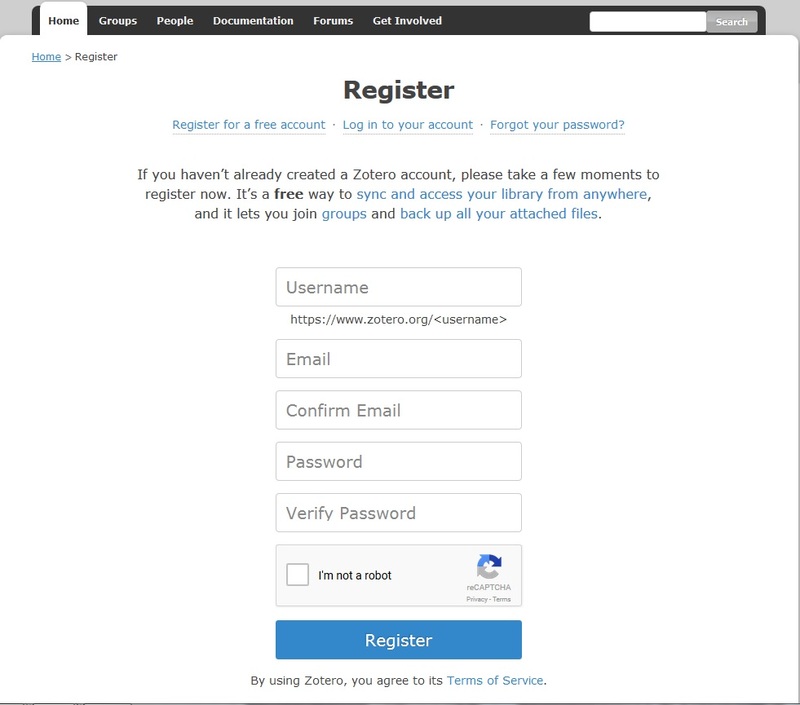 To set up an online account, go to the Zotero.org and click "Register" in the top right corner. 2. Next you will see a registration page where you can enter your preferred username, as well as your email address and chosen password. 3. After you have entered your information, you will see a message that says "Thanks for registering. We've sent an email to activate your account." Go to your inbox and follow the instructions in the email. 4. Once you have validated your email, you will be taken to a page that tells you how to set up the syncing function within your Zotero Standalone. It is crucial that you do this, so you can sync your library between your devices. 5. 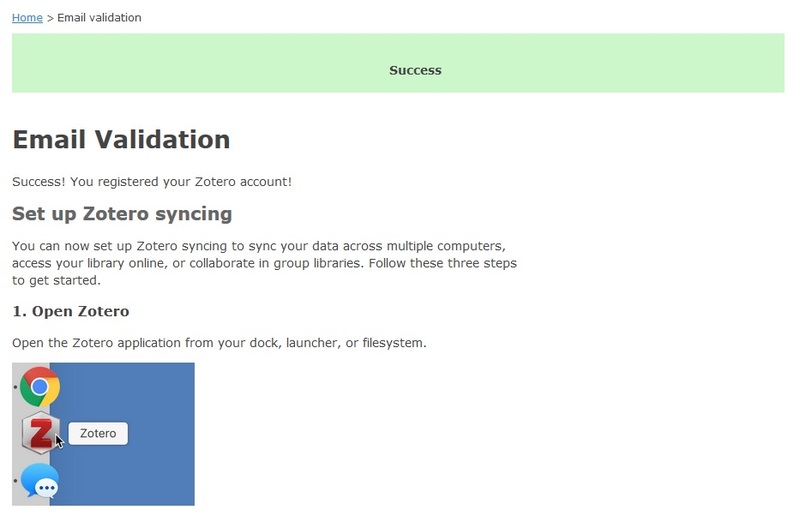 Once you have validated your email and set up the syncing in your Zotero standalone, you will be free to sync your library. 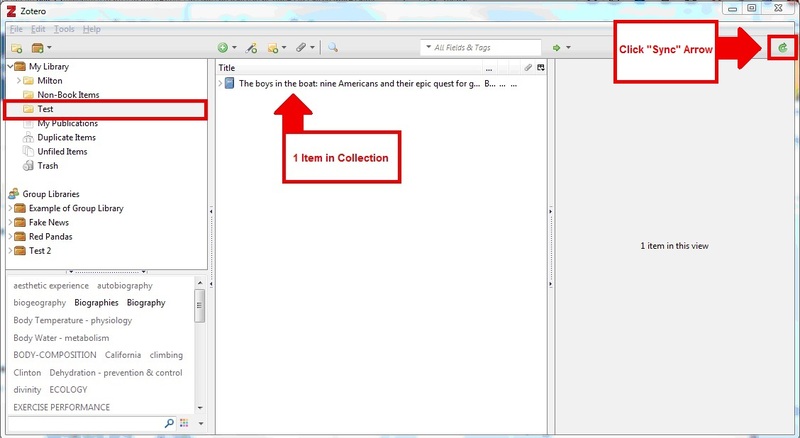 To do this, you need to hit the green arrow in the top right of your Zotero. In the example below, we have an item saved to our Zotero Library, but we haven't synced yet. Our online library says zero items. Hitting the sync button will allow the library to update in our online account; then if we need to sync to a different device, the library will have items in it. 6. Now that we've synced our library, our online account reflects what we see in our Zotero Standalone library; there is an item, that will be transferred when we sync on a different computer. 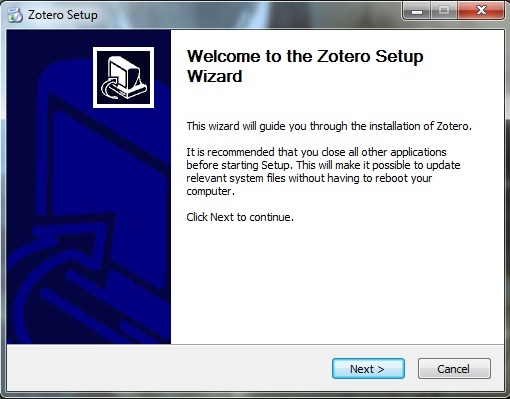 Having some trouble installing Zotero? There are lots of resources to help you out! Check out the Zotero Documentation and Support centre for help with installation. This guide from Oregon State University has some helpful tips on downloading Zotero using Chrome. The Zotero forums can have answers to very specific problems. This series of videos covers a range of Zotero topics, including installation, configuration and adding items to your library. Contact the UVic Library to get help with Zotero, or if you have any research or citation questions. We're here to help!